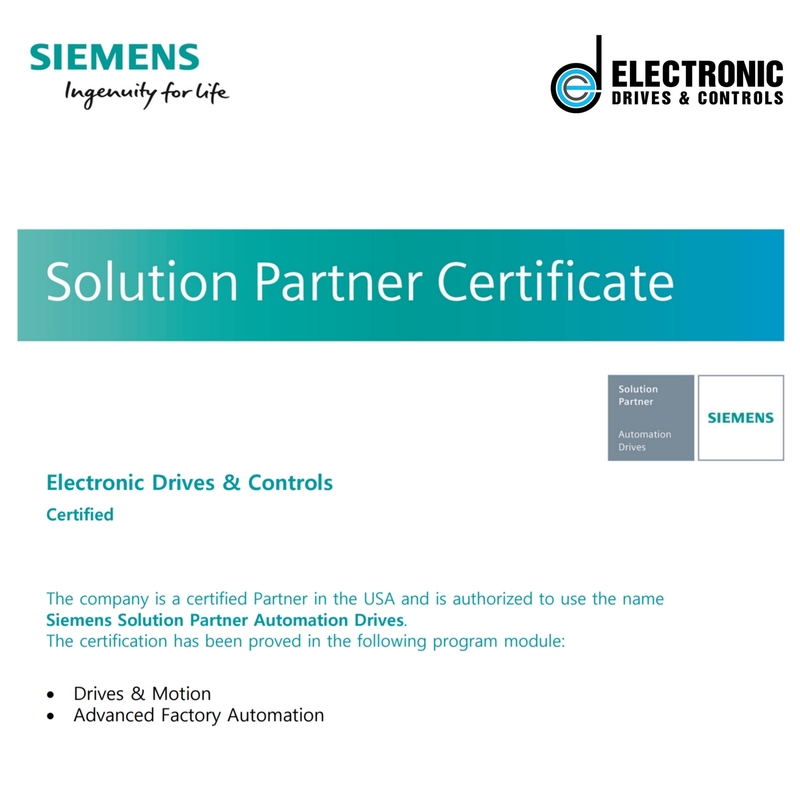 Parsippany, NJ – February 28, 2018 – Electronic Drives and Controls, Inc. (EDC), a leading control system integrator and field service company for industrial automation and drive technology, today announced it is the first U.S. Siemens Solution Partner to be certified for Drives & Motion. A Siemens Solution Partner since 2014, the company is also certified in Advanced Factory Automation. 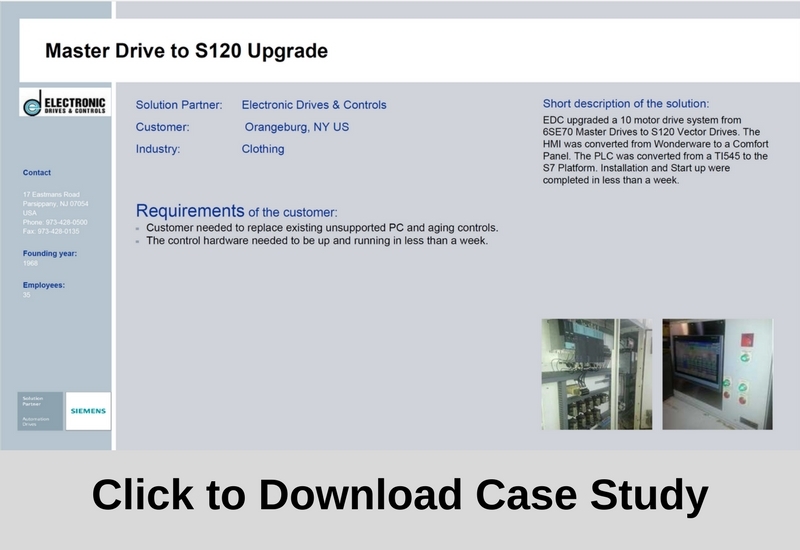 With this new certification, EDC has established itself as a strategic solution partner and leading system integrator focused on helping manufacturers with obsolete drive and control technology to automate manual processes and upgrade aging equipment. “Our congratulations go to Electronic Drives and Controls. This certification means their clients can always trust that EDC will professionally deliver the most advanced solutions based on the powerful combination of SINAMICS integrated drives and SIMATIC totally integrated automation,” said Peter Treible, National Industrial Partner Manager, Siemens. EDC has 50 years of experience integrating new control systems and repairing or retrofitting older equipment for a variety of manufacturing industries local to New Jersey, New York and Connecticut. With exceptional domain expertise, the company has also established itself nationwide as the go-to resource for manufacturers in the wire and cable, coating, laminating, and converting industries. When upgrading older equipment, automating manual processes allows manufacturers to gain a competitive edge with greater throughput and efficiency. It also sets the stage for leveraging the industrial internet of things (IIoT) and digitalization of the shop floor. In addition to EDC’s work with the manufacturing sector, the company has a field service business unit. Highly trained technicians perform repairs, large-scale retrofits, and preventative maintenance for customers in the pharmaceuticals, real estate management and HVAC industries. Founded in 1968, Electronic Drives and Controls, Inc. (EDC) is a CSIA Certified control system integrator with a large field service team specializing in AC and DC drives, PLCs and factory automation. 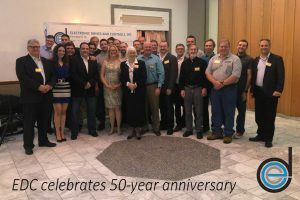 Family owned and operated for 50 years, EDC’s team of engineers and technicians has great depth of experience integrating new control systems and breathing life into older equipment. EDC has the engineering capability to design, build, start-up and service projects from the sophisticated to the simple and the service support team on call 24/7/365 to keep it all running at peak efficiency from day 1 and for years to come. In addition to the company’s certification as a Siemens Solution Partner and a Rockwell Automation Recognized System Integrator, EDC is a factory authorized/factory trained service center for over 40 drive brands. Engineering Consultant Bob Pusateri of Electronic Drives and Controls, Inc. will share best practices for installation and maintenance of energy-efficient variable frequency drives (VFD) to maximize building owners’ utility cost savings over the life of HVAC systems. Parsippany, NJ –May 6, 2018 – Electronic Drives and Controls, Inc. (EDC), a leading control system integrator and field service company for industrial automation and drive technology, today announced the company will present at the BuildingsNY 2018 Conference on May 8, 2018 at the Javits Center in NYC at 10:45am. The presentation, entitled “Ensuring VFDs Continue to Save You Money,” will be given by EDC’s Engineering Consultant, Bob Pusateri. In his presentation, Bob Pusateri will share what building managers can expect from VFDs’ energy cost savings and how to maintain those savings. Bob graduated from Rensselaer Polytechnic Institute with a degree in Mechanical Engineering in 1987. Since then, Bob has gained over 25 years’ experience in industrial controls, specifically with variable frequency drives and motion control. Before joining EDC as an engineering consultant in 2004, Bob held various relevant positions in manufacturing, sales, project management and development. 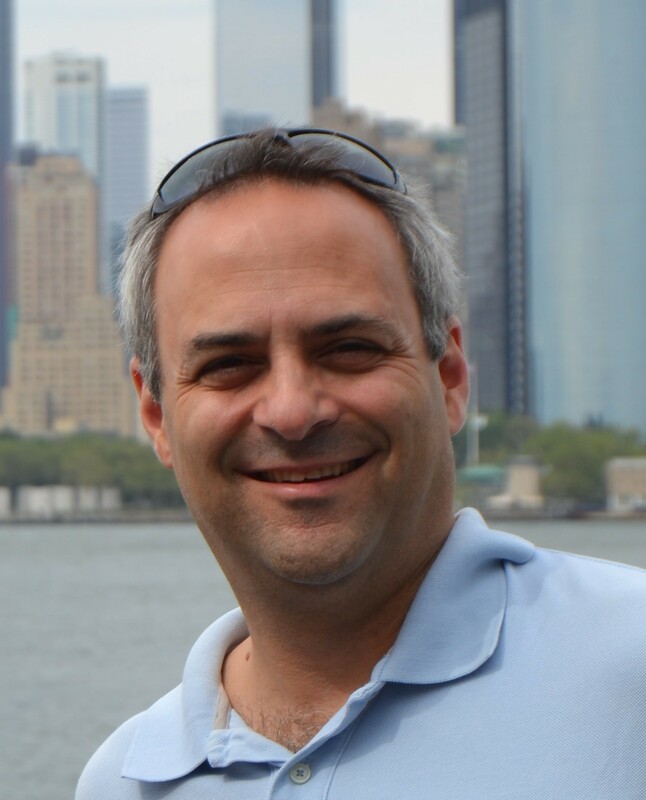 Bob’s experience has given him exposure to thousands of applications in dozens of automation brands. The BuildingsNY 2018 Conference brings together building owners and managers, facility and maintenance managers, superintendents, architects, contractors, developers and engineers with an opportunity to discover new ways to reduce overhead, manage risk and identify cost savings. Founded in 1968, Electronic Drives and Controls, Inc. (EDC) is a CSIA Certified control system integrator with a large field service team specializing in AC and DC drives, PLCs and factory automation. 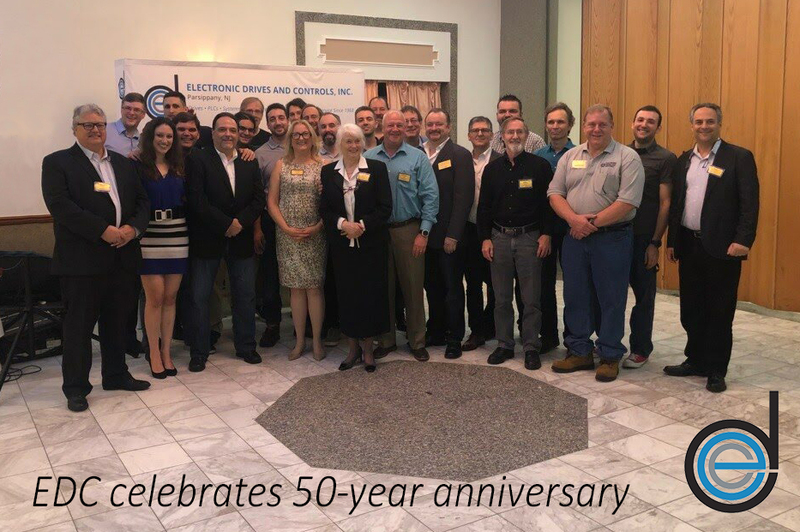 Family owned and operated for 50 years, EDC’s team of engineers and technicians has great depth of experience integrating new control systems and breathing life into older equipment. EDC has the engineering capability to design, build, start up and service projects from the sophisticated to the simple and the service support team on call 24/7/365 to keep it all running at peak efficiency from day 1 and for years to come. In addition to the company’s certifications as a Siemens Solution Partner and a Rockwell Automation Recognized System Integrator, EDC is a factory authorized/factory trained service center for over 40 drive brands.